Bookmarks are a powerful tool for marking parts of the document, which can be later retrieved and reviewed. They can be added to the document both programmatically and via the UI. You can also have hyperlinks pointing to the annotations in the document. This is very convenient, as it provides the means for easier navigation in the document and enables features like table of contents. Bookmarks can be inserted in the document and removed through the ManageBookmarksDialog of RadRichTextBox. this.editor.InsertBookmark(string bookmarkName) – inserts a Bookmark with the name specified. If there is selection in the document, the BookmarkRangeStart will be inserted just before the first selected element and the BookmarkRangeEnd will be added at the end of the first selection range. this.editor.Document.GoToBookmark (string bookmarkName) this.editor.Document.GoToBookmark (BookmarkRangeStart bookmarkStart) Both methods move the caret to the bookmark specified. 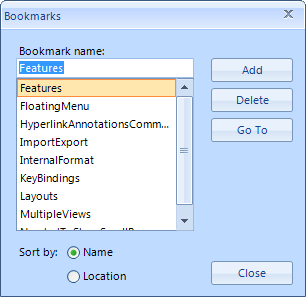 As bookmarks with the same name cannot be inserted in the same document, the name of the bookmark can be used as an identifier. this.editor.Document.Selection.SelectAnnotationRange(AnnotationRangeStart annotationStart) – selects the annotation passed as parameter. Particularly useful, as most methods of RadRichTextBox and RadDocument operate on the selection. For example, if you invoke this.editor.Delete(false), the text of the Bookmark along with the Bookmark itself will be erased. this.editor.DeleteBookmark(string bookmarkName) this.editor.DeleteBookmark(BookmarkRangeStart bookmarkRangeStart) These two methods remove the bookmark. The text in the document between the BookmarkRangeStart and BookmarkRangeEnd is not deleted. this.editor.Document.GetAllBookmarks() – returns an IEnumerable containing all BookmarkRangeStarts. this.editor.Document.EnumerateChildrenOfType<BookmarkRangeStart>() – returns all Bookmarks in the document. This method can be used on document elements other than RadDocument, in case you want to detect all bookmarks in a limited part of the document, e.g. a Paragraph or a Table. You can also add Bookmarks in a document you are creating manually. As both BookmarkRangeStart and BookMarkRangeEnd inherit from Inline, they can be added to the Inlines property of a Paragraph, just like any other Inline. You can also have document positions go to the start or end of the Bookmark and perform non-standard operations.